manufactured and played worldwide, constructed by craftsmen or mass produced in numerous forms and shapes reflecting the material available to the makers, and of ancient origin. This article explains what a Jew’s harp is and its global appeal; briefly explains what we know about the English language name; looks at the archaeological evidence; considers the relationship between instruments in Asia and Europe, and, finally, their likely transfer east to west. 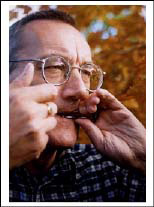 What is a Jew’s harp? The first thing to recognise is that Jew’s harps are subtle musical instruments with an extraordinary variety of shapes, sizes and methods of playing. They are international, being made extensively throughout the world from Polynesia, Asia, and Eastern Russia to Europe and the United States. They are known in the Middle East and Africa, though these were exported from Europe or introduced as barter by early colonists and do not appear to be native to those countries. aerophone, or one that produces sound primarily by causing a body of air to vibrate — an argument that is still going on. Worldwide around 1000 different names for the instrument have been noted, and the list is expanding. European languages mainly use mouth and sometimes lips or teeth linked with trump and harp. Trump in various forms and spellings is used today in Europe, such as Mondtrom in Dutch and Tromp in Flemish. Harp is used in Scandinavian countries, such as Norway, Munnharpa, Denmark, Mundharpe and Finland, Huuliharpu. Doromb can be found in Hungary, with Drymba in Ukraine and Drombulja in Serbia. As we go further east we have variations on Komys, Kupus, and Khomus in northern and eastern Asia, while Morchang, Morsing, Dan Moi and Gengong can be found in India, Vietnam and Indonesia. As a general point, in Asia the instrument has a name relating to the material from which it is made, along with animal or insect terms and sounds, whereas in Europe it has more human connections and names of other musical instruments. There is, in addition, the use of more derogatory terms such as lackey, bauble and snore [Bakx 2004]. Fig. 2. “Roman” Jew’s harp. gives us the early name but a port of origin, Arnemuiden west of Antwerp, and the merchant for whom the consignment was intended, a certain William Codde. It also clearly indicates that the names Jue harpes and Jue trumpes were in common usage in the late 15th century and known to both customs officer and merchant [Wright 2004]. The term Jaws harp is not seen before the mid-eighteenth century. There has been a suggestion that the instrument might originally have been called a trump, from the French Trompe, but clear evidence is lacking. That name, however, is still used today in parts of Ireland and Scotland. Fig. 4 Uppsala Jew’s harp. when played, plucked with the finger and allowed to run freely between the frame in order to obtain a note, it breaks quite frequently. Without its reed the Jew’s harp is completely useless for music, although one frame was found used as a gate catch in Hawkshill, Surry, England [Elliston-Erwood 1943]. The age of finds is often hotly disputed, and accurate dating has been difficult, particularly up to the immediate post-war era. Three Jew’s harps, for example, discovered in the 19th century in Gallo-Roman sites at Rouen and Parthenay, in France, have caused some excitement in Jew’s harp circles, as have a fair number of mid-20th-century instruments found in the Southeast of England and dated as Anglo- Saxon (Figs. 2 and 3). But we have problems. Firstly, while there is no doubt that the finds came from Gallo-Roman and Anglo-Saxon sites, they could have been dropped there at a later date and are sometimes described as top-soil finds. Secondly, when we look at how the instrument arrived in Europe, there is no evidence of indigenous populations of the Roman Empire using them and, to my knowledge, no references by Roman writers that such instruments were played. My concern regarding the Anglo-Saxon finds is that there is the similarity with Jew’s harps recovered in an 18th-century North American site. We either have to accept that the frame shape remains identical from Anglo-Saxon to Colonial American times or that the Anglo-Saxon instruments are in fact from the 18th century [Kolltviet 2000, p. 390]. the bow shape now associated with modern instruments. Gjermund Kolltviet has recently completed a PhD thesis on 850 European finds, and his research was due for publication late in 2004. He has used a typology system to provide an explanation as to the relative ages of Jew’s harps throughout Europe, with his basic theory being that the oldest instruments are like the Uppsala find and, as the instrument evolved, the bow section became more pronounced, while the playing section became shorter (Fig. 5) [Kolltviet 2000, p. 389]. We have visual references in Europe going back to the 14th century, the earliest of which comes from the seal of the Trompii family of Grüningen, near Aarburg, Switzerland, dated 1353, and there is no doubt that this is a Jew’s harp of, if we accept Kolltviet’s system, a late type (Fig. 6) [Crane 2003, p. 3]. In England there is a fantastic series of miniature enamels of angels playing various musical instruments displayed on the Crosier of William of Wickham, to be found in the chapel of New College, Oxford, one of which not only clearly shows a Jew’s harp, but the angel flicking the instrument’s tongue with his finger (Fig. 7). There are also a number of watermarks from the late 14th century from a widespread area of northern France and the Low Countries [Crane 2003, p. 4]. The only definite dates we can rely on for Europe are, therefore, the 13th-century find in Sweden, and the mid-to-late-14th-century images from the seal and the New College crosier. 4th century BCE on (Fig. 8), but finds are few and far between and the time gaps are immense. A better idea of the huge variety of instruments is provided by the study of local instruments collected by museums. 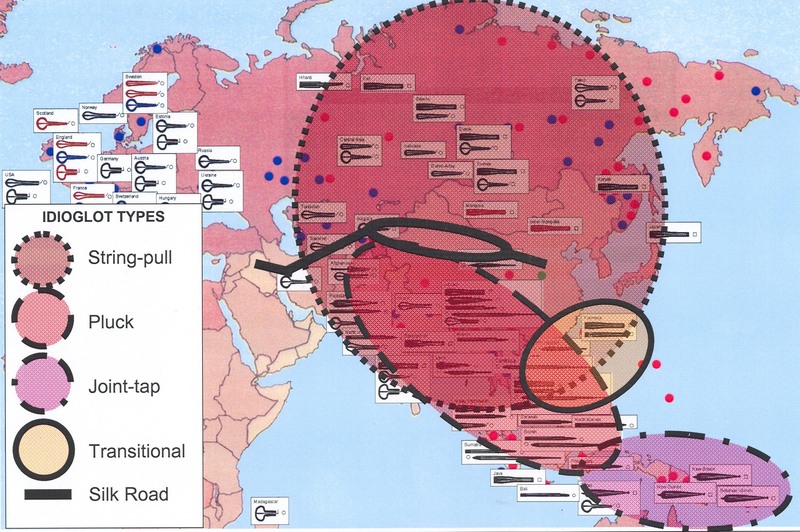 Bringing together these two strands provides a bigger, if risky, picture (Map 1). The most likely and compelling theory of the beginnings of the instrument suggests an Asian origin, though there is no evidence to support the hypothesis. Bamboo examples are played throughout Asia and Polynesia, but, because of the basic structure of the single reed concept, it is possible that the instruments evolved in various ways independently rather than from one single source. The Polynesian types, for instance, require the player to find an optimum part of the reed, which is then tapped or bounced upon a bony part of his wrist or knuckle, allowing the reed to vibrate through the frame. Filipinos and North Vietnamese, on the other hand, have instruments that are plucked with the thumb or finger. A common method, however, that is found from Bali to Siberia, Japan to Nepal, is a string-pull (Fig. 9). It is this type that was found in Inner Mongolia dated circa 4 BCE (date unsubstantiated). Curt Sachs, the esteemed musicologist, suggested that the change from bamboo to metal is likely to have occurred in Northern India [Sachs 1917]. Sibyl Marcuse points out that the instruments of Taiwan and Engalio of the Philippine Islands represent a transitional type, as these are idioglot in form, but hetroglot in manufacture (Fig. 10) [Marcuse 1965, p. 264]. They are, however, on islands on the eastern periphery of known Jew’s harp use. A bamboo or wooden frame with a metal tongue produced in Vietnam does have the characteristics of a hetroglot instrument, but might just as well be a copy of the metal type using local materials. 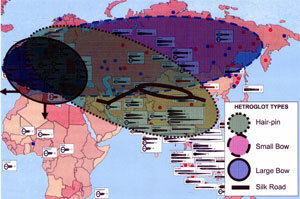 What is apparent is that idioglot instruments centre around Asia and hetroglot centre around Europe (Maps 2 and 3). The western regions are indicated as the Urals and the Caspian Sea, influenced by the Mediterranean, Mesopotamia and Europe; the southern as Central Asia and Kazakhstan, influenced by Iran, Afghanistan and India; eastern as Zungaria, Kansu (provinces in northwestern China) and Mongolia, influenced by China, with a limited impact from the north that stretched from Scandinavia to the Bering Straits [Ibid.]. Linking these to Jew’s harps played in known regions provides a way in which they might have spread, particularly from the south and east (Map 4, previous page). Map 1. 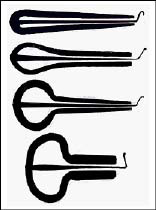 World Jew’s harp types. Map 2. Idioglot Jew’s harp areas. to the north. Again the Anglo-Saxon finds might have come via the Hun invasions of the 4th century, particularly as more instruments are to be found in the area north of the Caspian Sea. 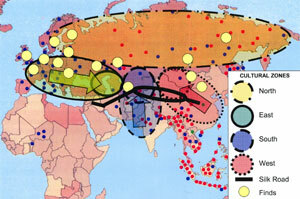 Thus there is a more rational link east to west. 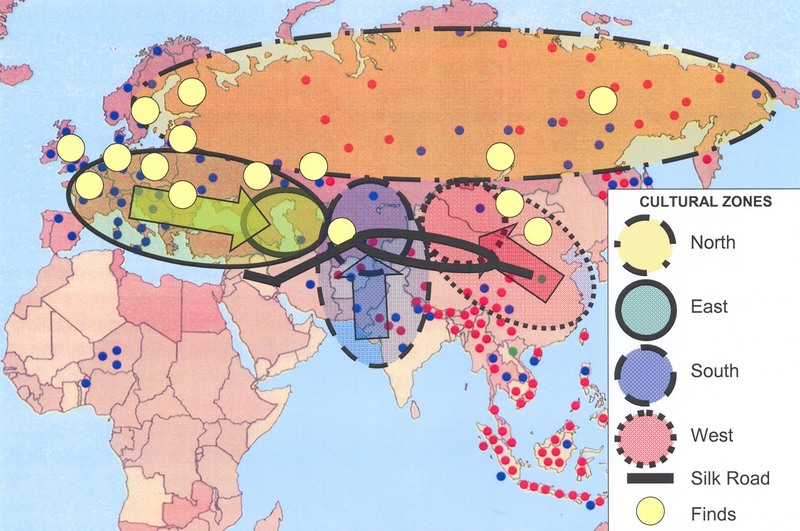 Given the theory that the Huns originated from the eastern end of the Eurasian Steppe as the Xiongnu (Hsiung-nu), and the wooden Jew’s harp find from a Xiongnu burial site in Mongolia, this looks possible. The Turkic movements of the 6th and 7th centuries also look promising, and we have the trade routes post-Marco Polo and the Mongol invasions, both of significance in the potential for cultural spread, but possibly a little late. 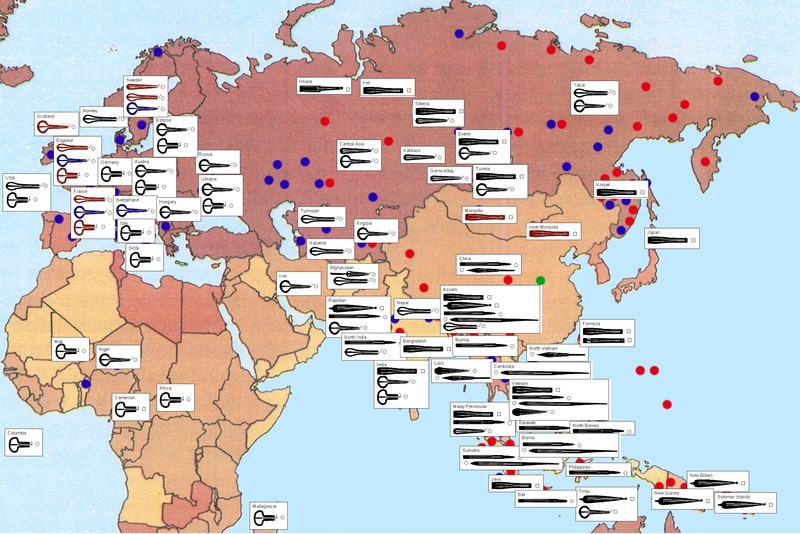 Jew’s harps in Asia, though scarce, have been found in archaeological sites in Bashkortostan, Altai, Khanty-Mansi Oblast, Buryatia, Sakha (Yakutsk, Vilyuisk), China (Inner Mongolia) and Mongolia (Map. 4). I have drawings of the Bashkortostan, and Inner Mongolia instruments, but not the others to date. So it is difficult to assess if there are any patterns of type or development, although with so few, it would be highly conjectural anyway. Finds from Finland make interesting comparisons with those played in Afghanistan, though how much emphasis can be put on the importance of modern instruments as indicative representations of a particular people’s ancient traditions is also open to speculation. The Jew’s harp is an international instrument that is likely to have originated in Asia and travelled to Europe, arriving sometime around the 13th century. Archaeological evidence might push the date further back, and a substantiated Roman find would be a fantastic discovery, as would any instruments unearthed along the western section of the Silk Road. The Jew’s harp appears in Europe fully formed. Older types could be hairpin in shape developing into the later bow section common today, but there are no idioglot finds. These could have been wooden and have rotted away, but the lack of any other description or indication of an evolving instrument seriously undermines an earlier existence before 1200. That it is an ancient instrument, there is no doubt. Finds are gradually coming to light and the picture is a little clearer, but what may well move the theories forward is the pulling together of information from outside the specific archaeological finds and ethnomusicological collections. Trade looks to be a likely source. We await further revelations that I am convinced will appear. The important thing is that this musical instrument clearly is worth investigating further and that the evidence be collected, preferably in one place. Map 3. Hetroglot Jew’s harp areas. help raise the profile of this international, historic and versatile musical instrument. Geneviève Dourdon-Taurelle and John Wright. Les Guimbardes du Musée de l’Homme. Paris: Institut d’ethnologie, 1978. Gjermund Kolltviet. “Archaeological Jew’s Harp Finds in Europe: Chaos or Coherence?” In: Studien zur Musikarchäologie.2 vols., Vol. II: Musikarchäologie früher Metallzeiten. Ellen Hickmann et al., eds. Rahden: Verlag Marie Leidorf, 2000. Curt Sachs. “Die Maultrommel. Ein typologische Vorstudie.” Zeitschrift für Ethnologie, 49 (1917): 184-200. 1. 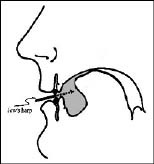 Dourdon-Taurelle and Wright 1978 use a categorization of the Jew’s harp based upon the direction of the tongue or lamella in relation to the hand — pointing towards or away. This article uses the more usual Sachs system of hetroglot and idioglot.